An artist's rendering of the Waterfront Toronto neighbourhood. Sometimes Sidewalk Labs must wonder why on Earth it ever came to Toronto. The Google offspring arrived in the city with a splash in 2017 when Waterfront Toronto chose it to create a 21st-century neighbourhood that would use data and technology to improve the quality of urban life. It seemed like excellent news. One of the world’s richest companies was coming to town to help Toronto prepare for the future. 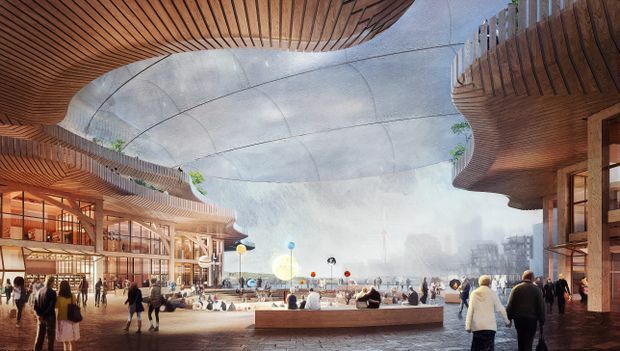 Sidewalk Labs chief Dan Doctoroff, a top business executive and former deputy mayor of New York, said Toronto was just the place to experiment with using things such as autonomous vehicles, freight robots and street sensors to build a smarter, more sustainable city. But it didn’t take long for skeptics to start hurling spitballs. First they said the whole thing was a plot to steal our data. Google, which made its fortune through data mining, was just looking for a new way to harvest our information. Never mind that Sidewalk offered to share any data it collected and to strip out any details that would identify individuals. Now they are saying that Sidewalk is trying to steal our waterfront. When the Toronto Star reported last week that the company was hoping to expand its experiments to the Port Lands at the eastern end of the downtown waterfront and even – horrors – to help pay for a light-rail transit line to the area, a new storm blew in. “Politicians react with shock, anger to Google’s sweeping vision for Port Lands,” one headline said. “Sidewalk Toronto faces growing opposition, calls to cancel project,” another said. This uproar is even stranger than the one over data theft. Sidewalk isn’t planning to invade and colonize the Port Lands, even if it had the power. The company has been saying for a long while that the 12-acre waterfront plot known as Quayside covered by its partnership with Waterfront Toronto is too small to test some of its innovations properly. To see if they really work, it would need to scale up. The Port Lands, right next door, is the ideal place to do it. This huge, shabby chunk of real estate has stood neglected for decades. Its potential is enormous. Few big cities have such an expanse of undeveloped land right near itscore. Yet the cost of building infrastructure that would clear the way for development – sewers, roads, transit – runs into the billions. Can it possibly be a bad thing that a company with pockets as deep as Sidewalk and its parent, Alphabet Inc., owner of Google, is willing to pitch in? Sidewalk’s offer to help fund a waterfront light-rail line is especially welcome. Good transit is a key to making the Port Lands an attractive place to live, work and visit. The LRT project has been in the city’s plans for years, a theoretical line on the map, and governments have failed to commit the money to build it. Sidewalk’s money could kick-start not just that project, but the whole long-delayed, much-anticipated rebirth of the Port Lands. Toronto doesn’t want to see a repeat of what happened on the other side of the city at Liberty Village, where a dense new neighbourhood grew up before proper transit was in place. Far better to put the tracks in first. All that Sidewalk wants in return for its LRT funds is a share of the development fees and property taxes that the project would help raise. That hardly seems outrageous. Sidewalk wouldn’t run the transit line, so it needs some way of recouping its investment. “If we actually play a role in financing something that otherwise isn’t going to get done, we obviously have to get paid back,” Mr. Doctoroff told CBC Radio’s Metro Morning. What? No. Toronto’s worst fear should be that Sidewalk gets exasperated with Toronto’s can’t-do attitude, bails out and goes home, much as Amazon did when it bailed on building a second headquarters in New York. In that case, at least, opponents could complain that governments were putting up US$3-billion in subsidies to get the giant company to come. In Toronto’s case, Sidewalk is putting up its own money to be part of reviving the city’s waterfront. Let’s just hope it stays.